Individuals having problems holding regular utensils due to limited grasping or weak hand dexterity will find the Utensil Holder a welcoming solution. 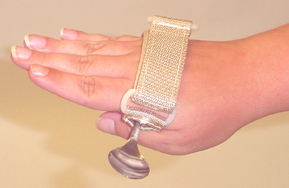 Problems holding or gripping small items are a common concern for the elderly and people living with physical limitations associated with cerebral palsy, arthritis and stroke. 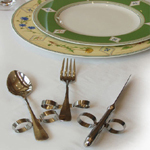 The Utensil Holder enables these individuals to independently use utensils for eating, cooking or grooming. The holder is made of a one inch wide, easy to clean, polypropylene webbing that features a "pocket" opening to accommodate the handle of a fork, spoon, comb, or toothbrush. It attaches with an adjustable Velcro™ hook and loop closure and a D-Ring thumb loop. 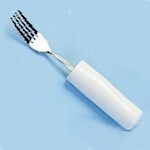 To use the Utensil Holder, simply wrap it around the palm of the hand using the adjustable hook and loop closure. Place the pocket against the palm of the hand with the opening towards the thumb. Make the necessary adjustments for a secure fit and insert the utensil. Now, with your utensils strapped to your hand, you can eat with ease and comfort. Available in two sizes: regular and extra large. The extra large size will extend up to a ten inch circumference. Comes 2 per package. Dining with Dignity offers individuals who are paraplegic or quadriplegic with grip impairments a way to dine independently.